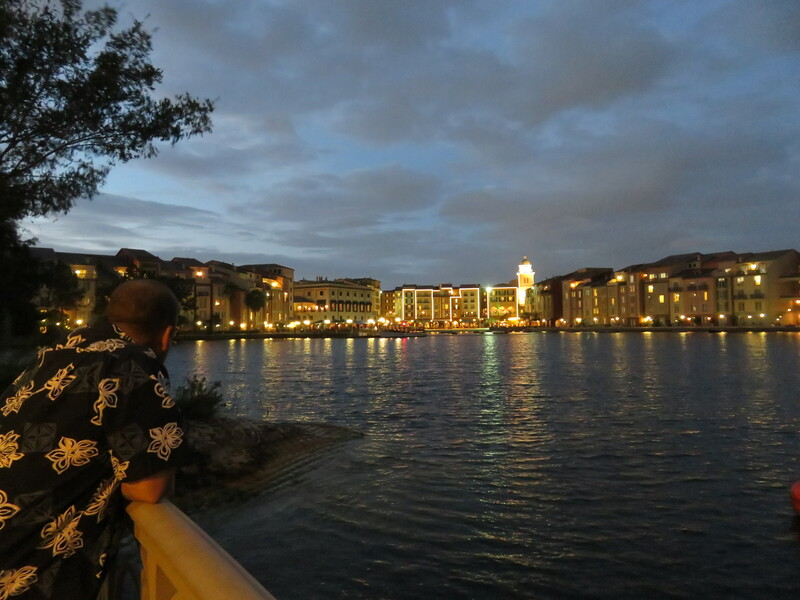 Loews Portofino Bay Hotel at Universal Orlando Resort is one of my favorite hotels in the world. 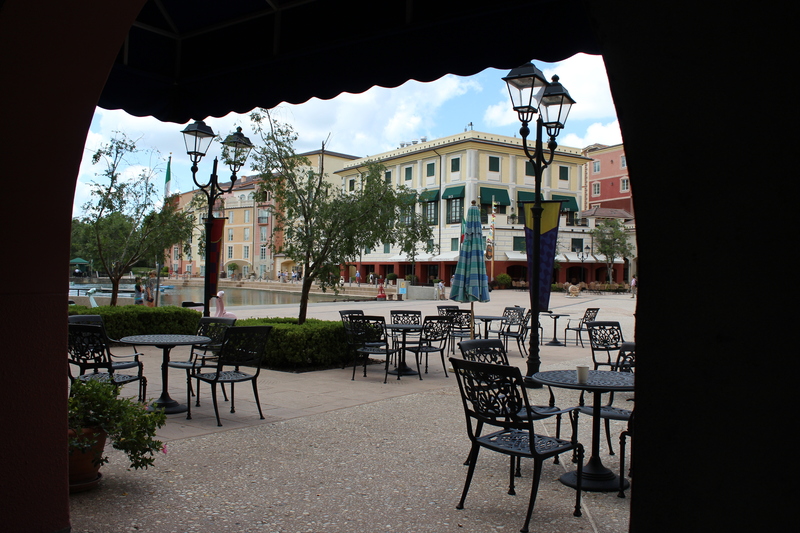 It is picturesque and looks exactly like the real deal in Italy. Only cleaner. It’s so serene and really does force you to slow down and savor the sweet life. 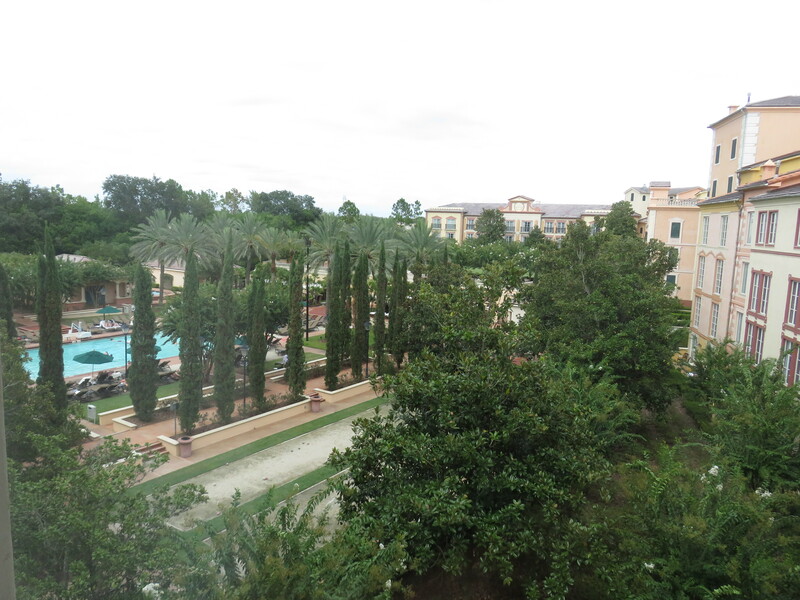 Our most recent stay was longer than in the past and much more relaxing as we enjoyed the resort as much as the theme parks. We arrived in the evening and after a lovely check in were in our room in no time. 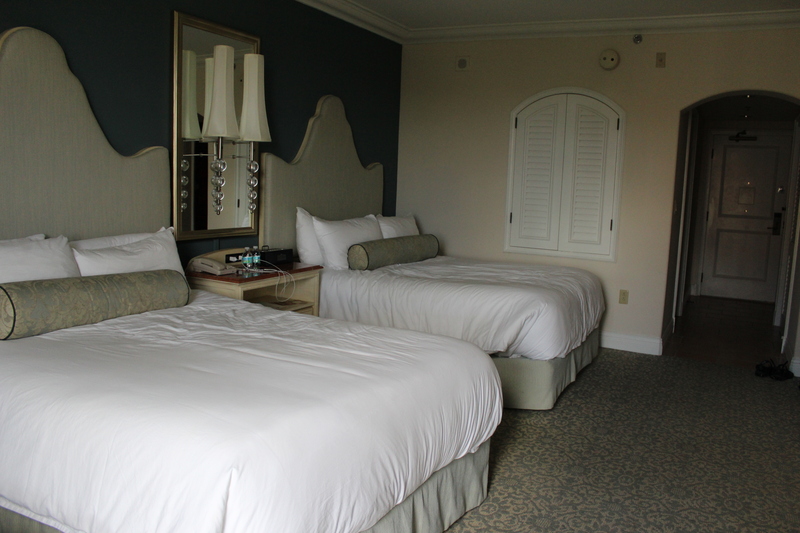 We stayed Club Level in a Deluxe room and found ourselves in the Villa Wing. Location was great, high floor which I requested and not too far from either the front elevator down to the lobby and club lounge or the back elevator which led right to the pool. 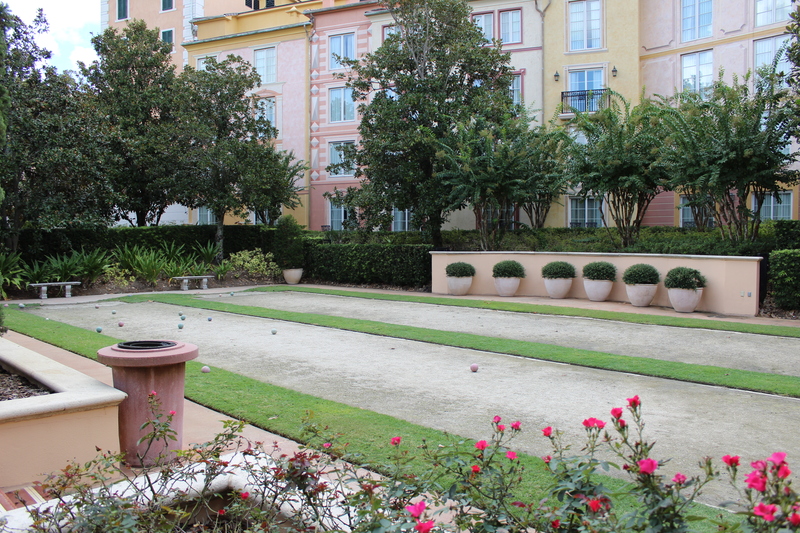 We had a lovely view of the Villa pool and Bocce Ball court. At 490 sq. 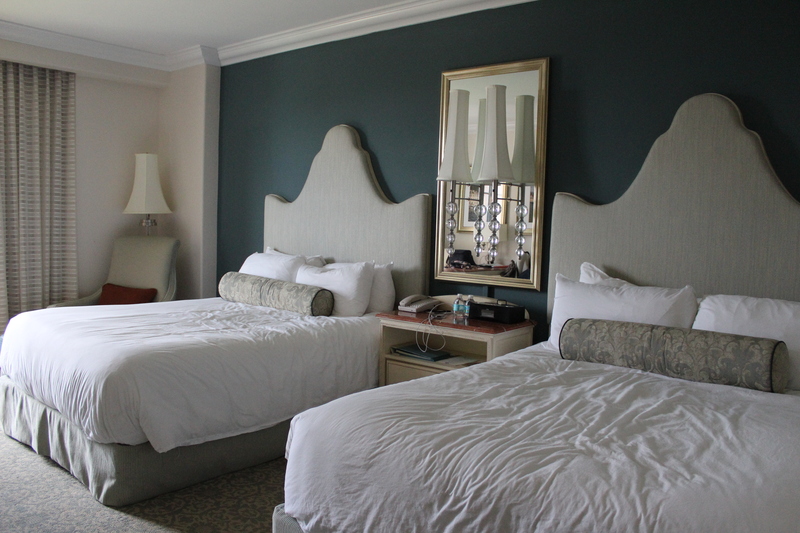 ft., the deluxe rooms are larger than the already very large Portofino rooms. The bathroom is also very spacious with a tub and separate shower. 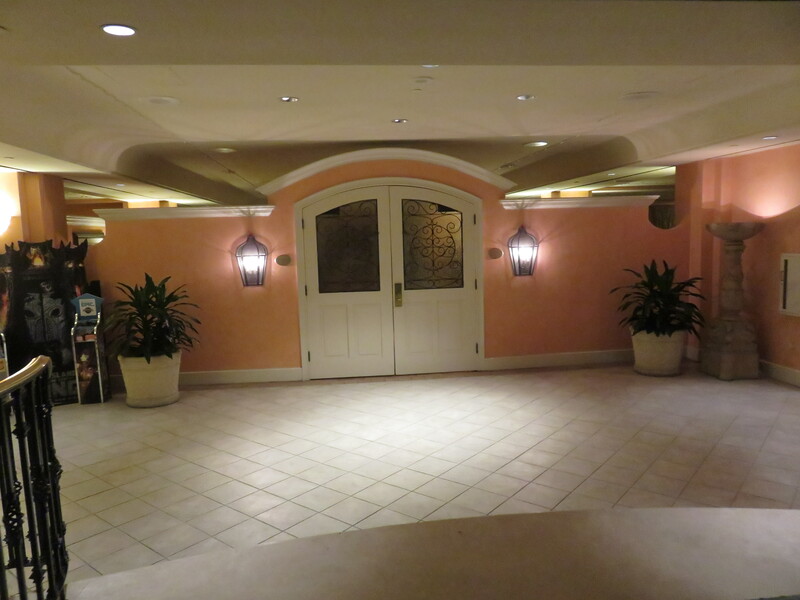 Club Level at Portofino was wonderful. 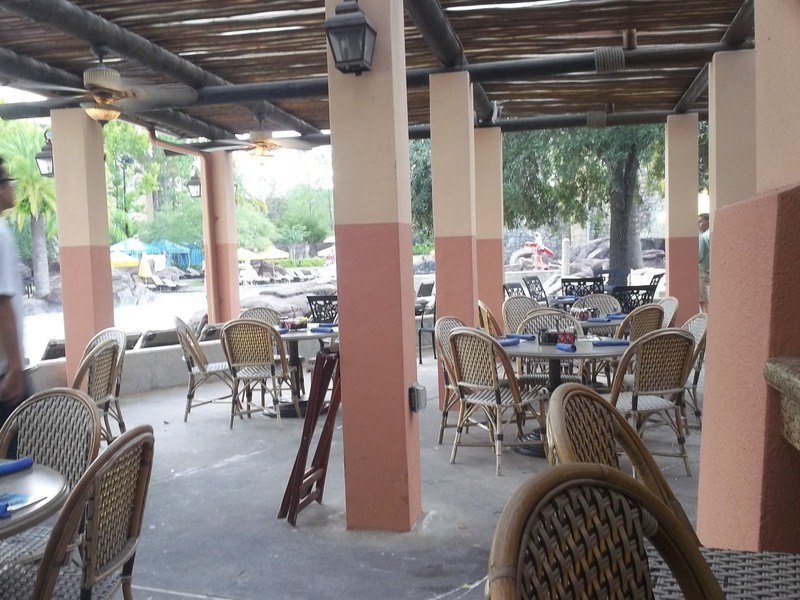 The staff is very helpful, friendly and they keep the food and drink stocked nicely. 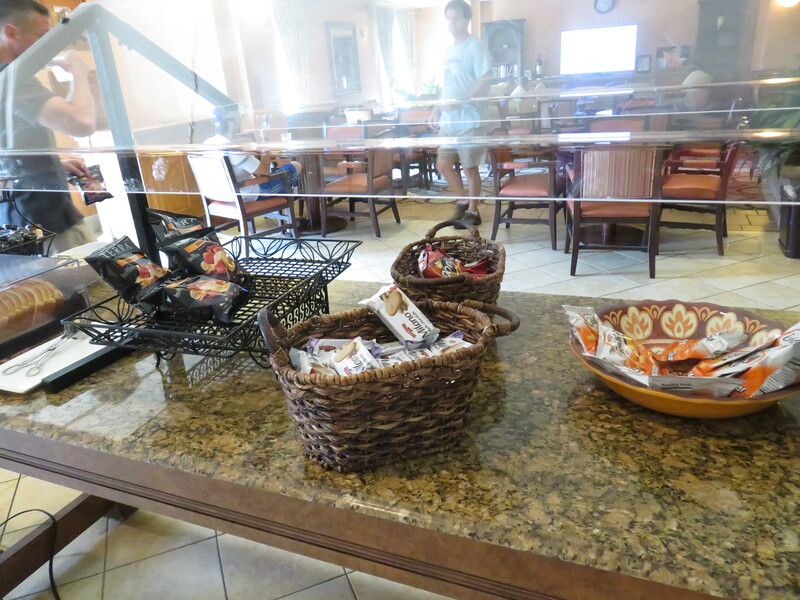 Club offers you food and beverage options throughout the day. 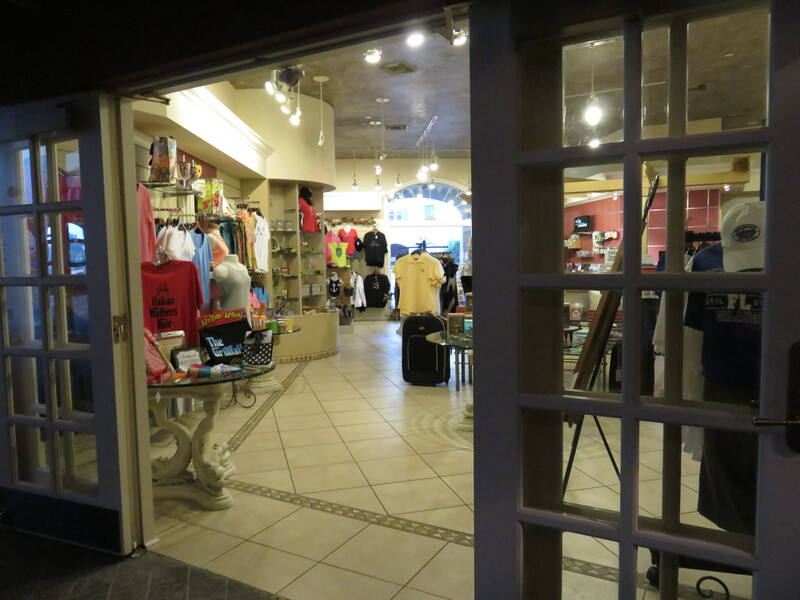 It was easy to stop by the lounge on the way in or out to grab water or a drink. 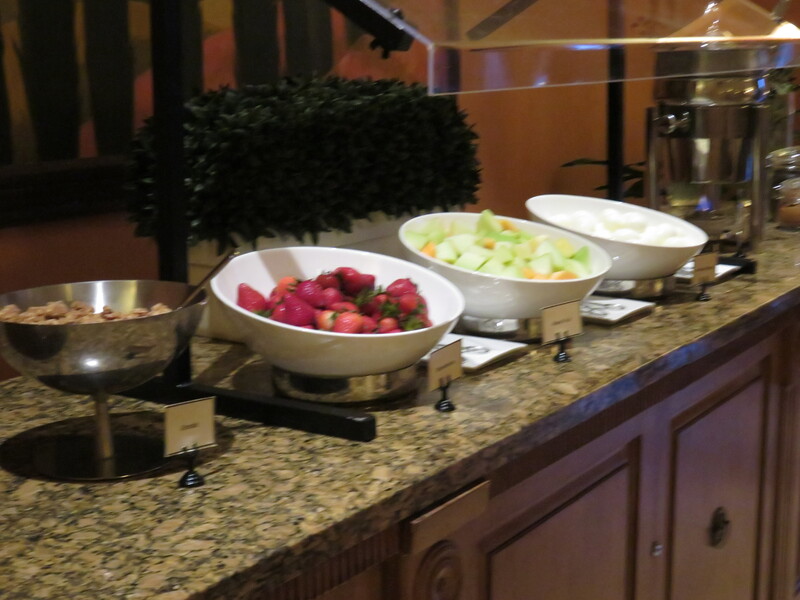 In the morning there is breakfast which includes fruit, pastries, cereal, hard boiled eggs, scrambled eggs and breakfast potatoes. 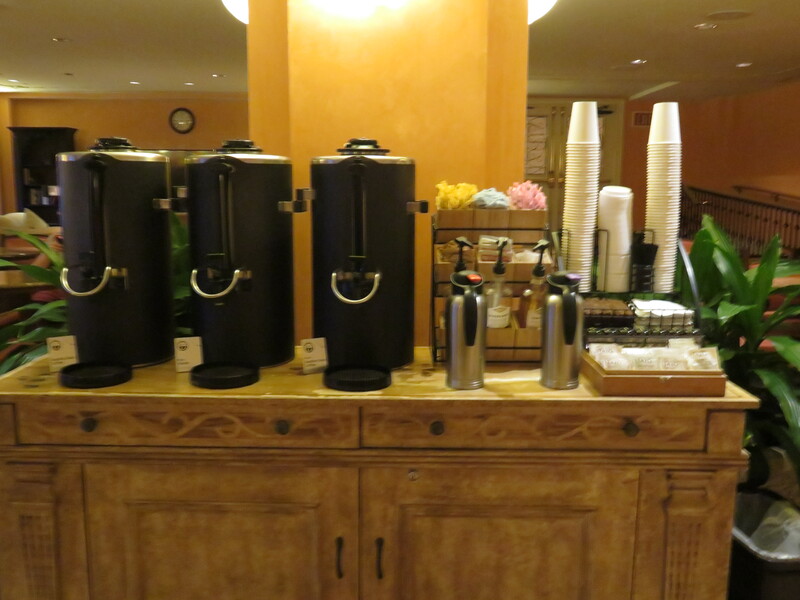 A coffee station as well as milk and orange juice station round it out. 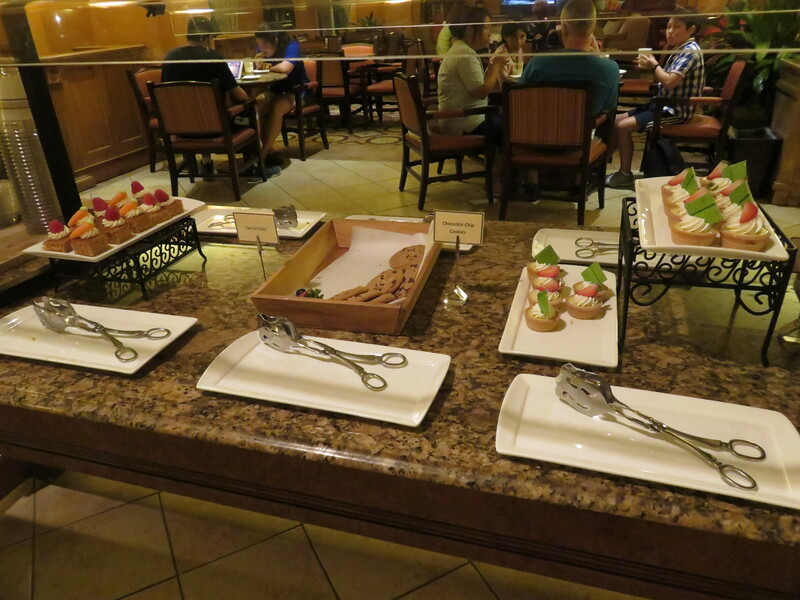 During the afternoon, snacks are available, chips cookies and the like. As well as lemonade. 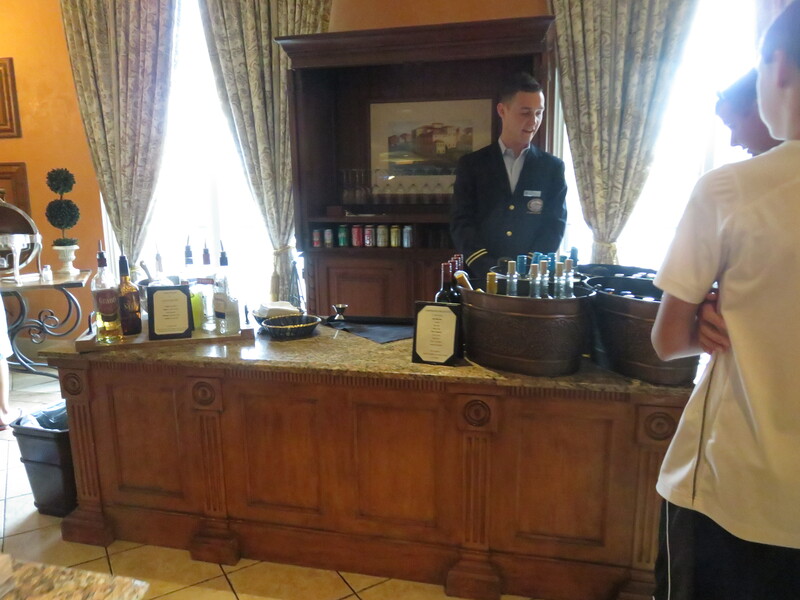 A drink station is available all day, anytime the lounge is open. 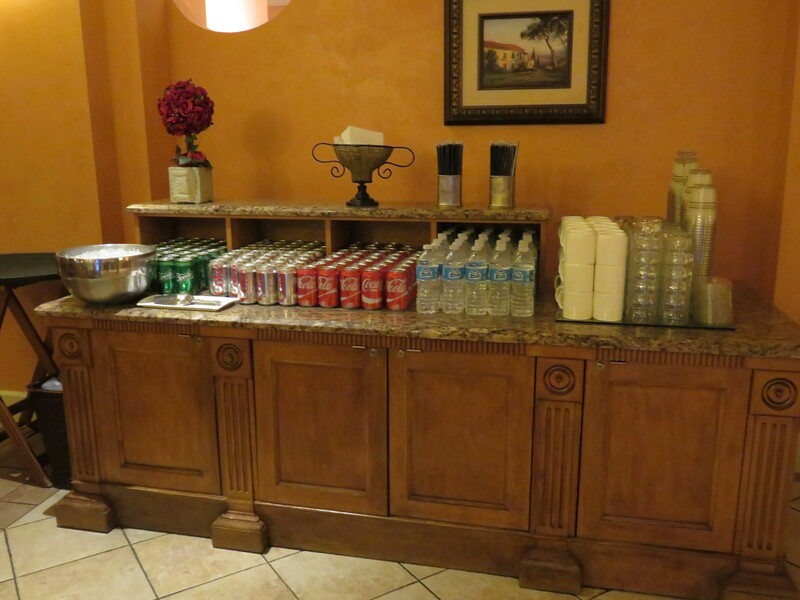 Soda and bottled water are available here as well as to go cups. 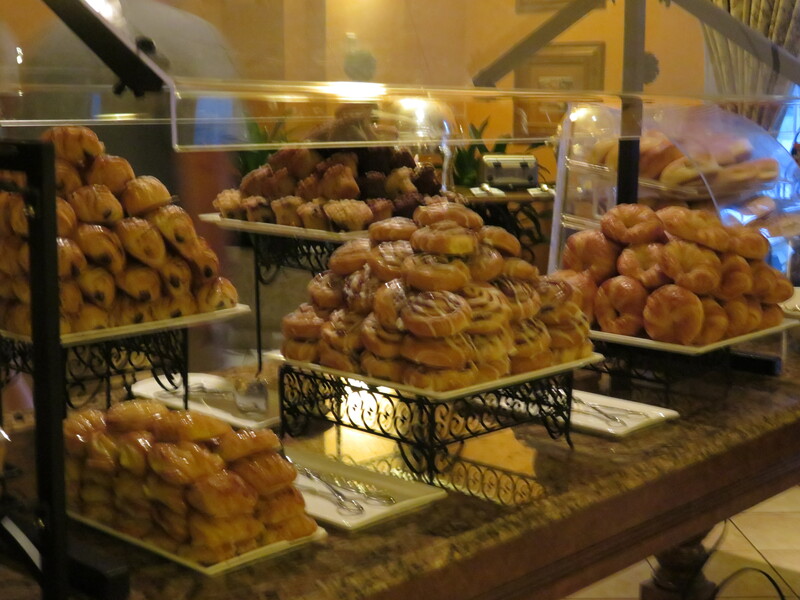 During the evening reception, 2 hot dishes are available, usually a pasta dish and something else. 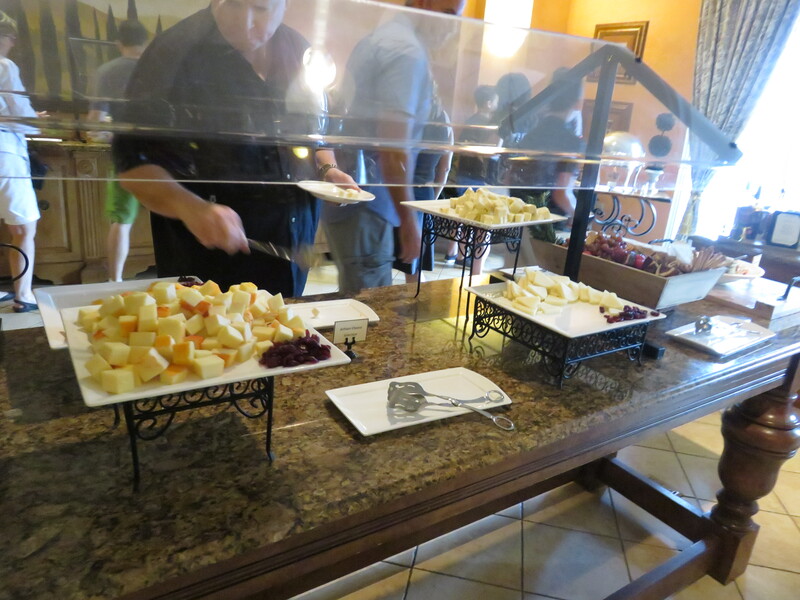 As well as a salad bar, cheese, crackers and wine and beer. Later, dessert with cakes and cookies. 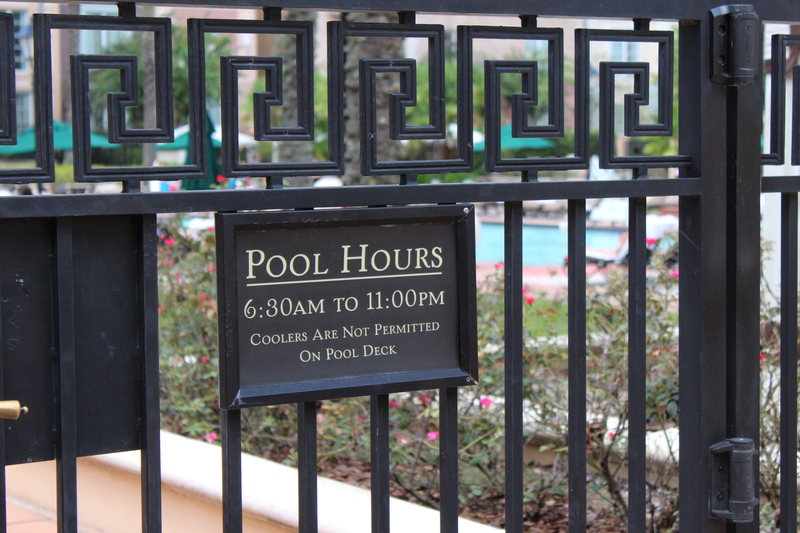 One of our favorite features of this hotel is the pool. The main pool is the Beach Pool. There are fun pool side activities for the kids and adults, the slide is fabulous and great food and drinks can be had at Splendido, the poolside bar. 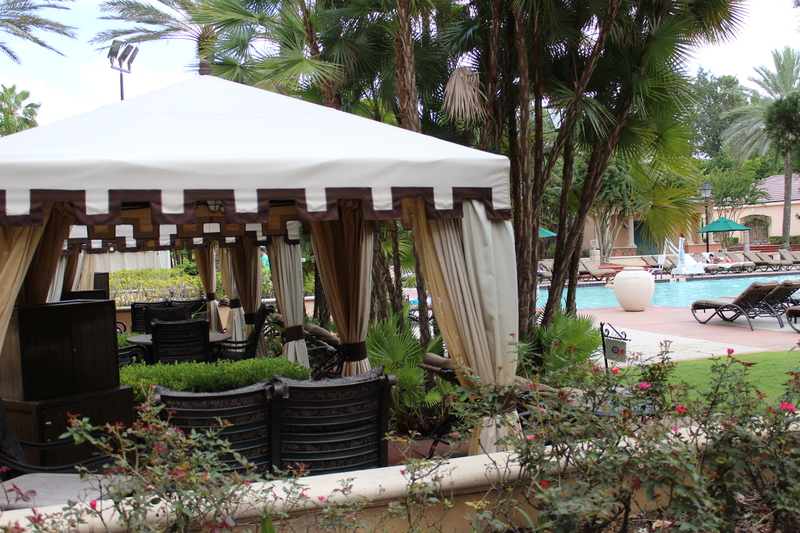 The villa pool is the quiet pool, with cabanas surrounding it and in just a beautiful serene location. 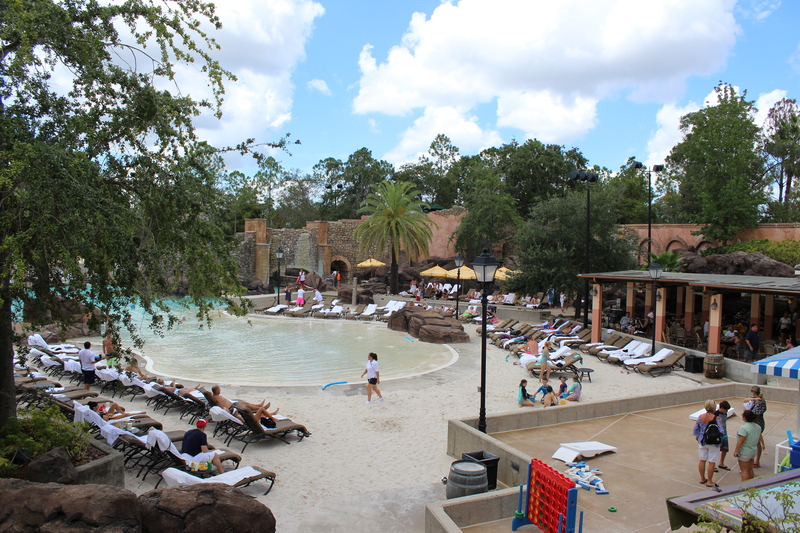 There is another small pool called the Hillside in the East Wing of the resort. Pools stay open late, 11pm and the main pool shows a movie at night right there on a screen on the beach in the sand. 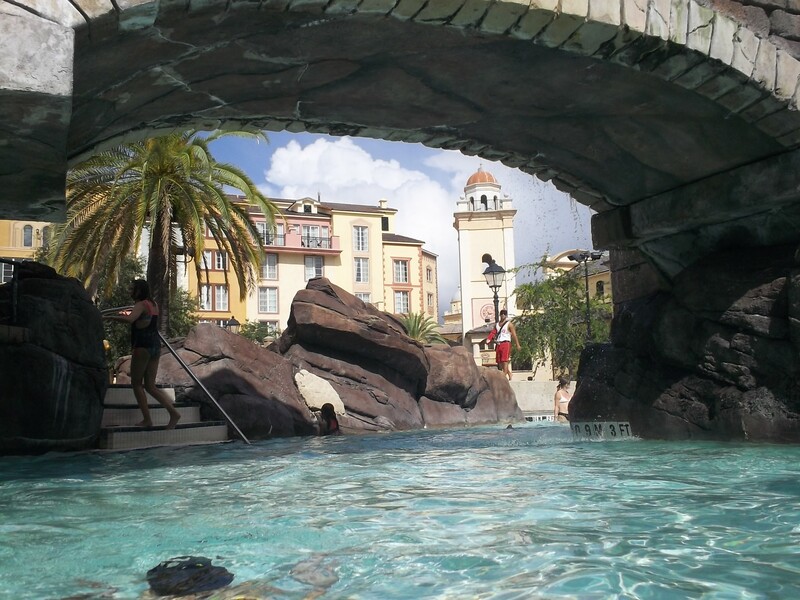 There is a lovely large hot tub at the Beach Pool as well, with a waterfall feature. Another hot tub and a small children’s splash pad rounds out the area. Music is playing all day and there is lots of activity. 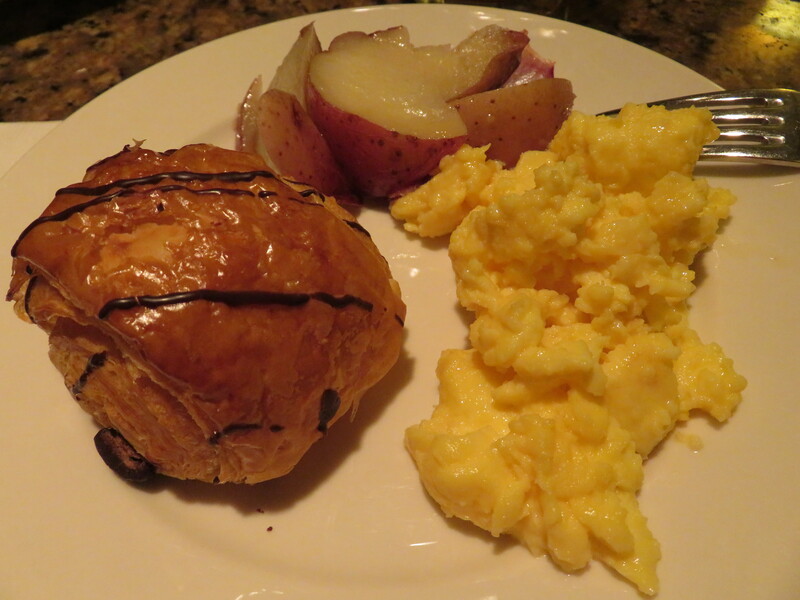 There are lots of great restaurant choices here, but it’s not far to City Walk or the other hotels either. 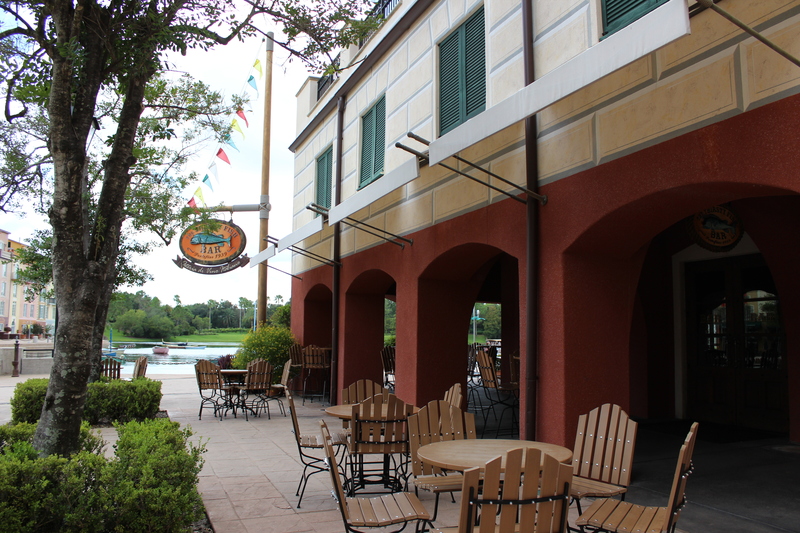 Bar food at Thirsty Fish, comfort food from Nonna at Mama Dellas or the Trattoria, something quick from Sal’s Deli or upscale Bice. Don’t forget gelato, it’s so good! There is a Starbucks as well. 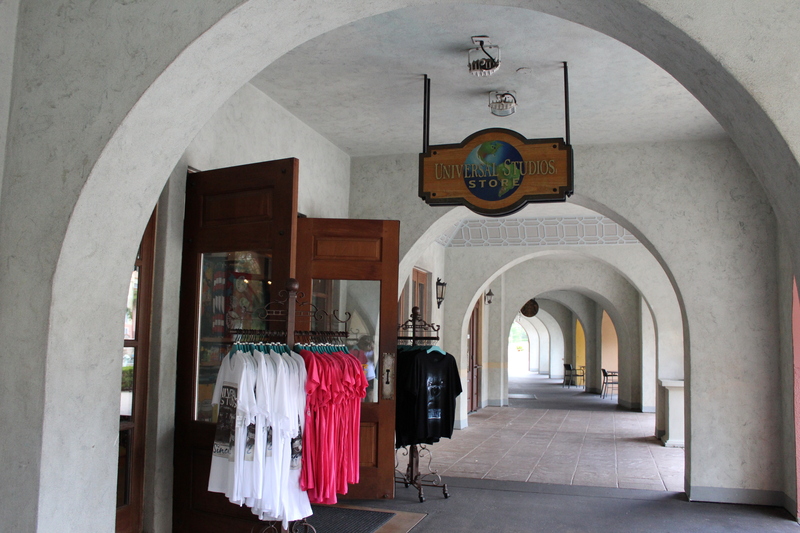 Shopping for art work and unique pieces, a Universal Studios Store and the hotel gift shop with some lovely unique gift ideas. 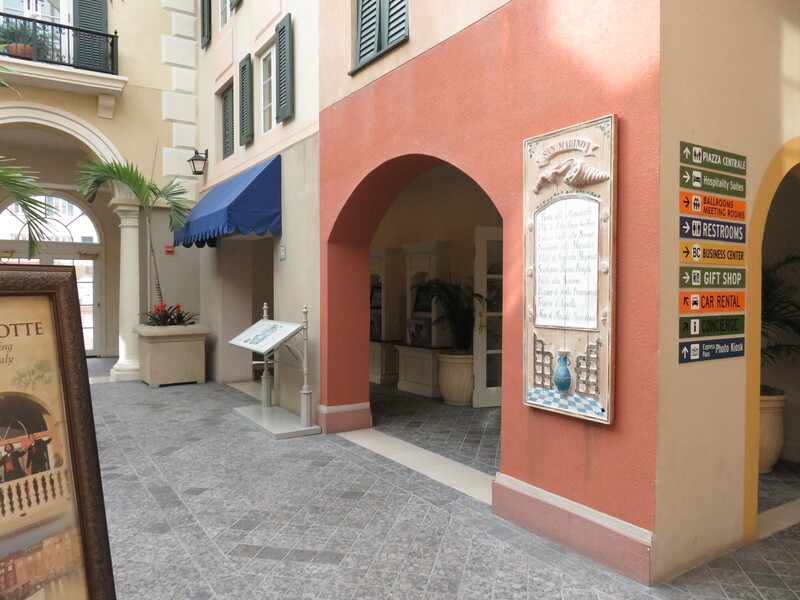 The walk to the parks is about 15 minutes via a lovely scenic path that takes you passed Hard Rock Hotel. Security will be a the end of the path just before arriving at Universal Studios. The boat is quick and easy and you will go through security before boarding the boat. 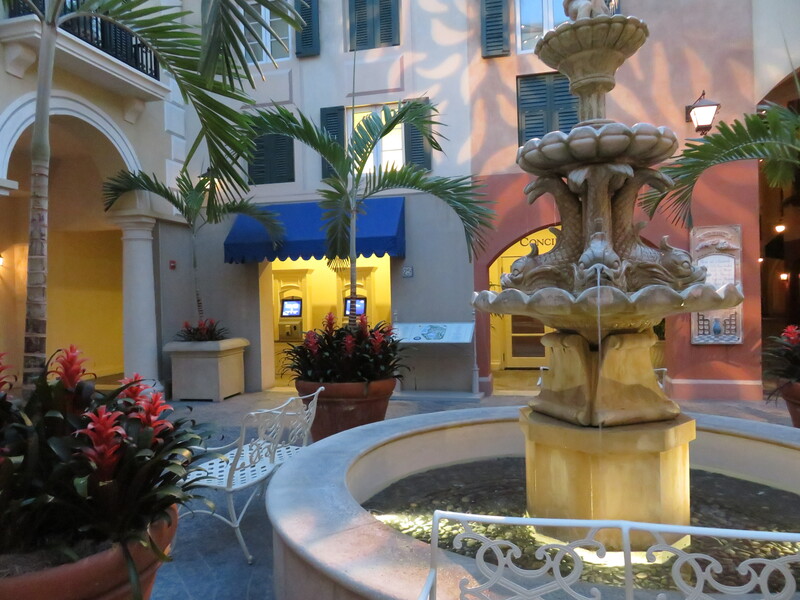 A little bit of “la dolce vita” right in the heart of the theme parks! 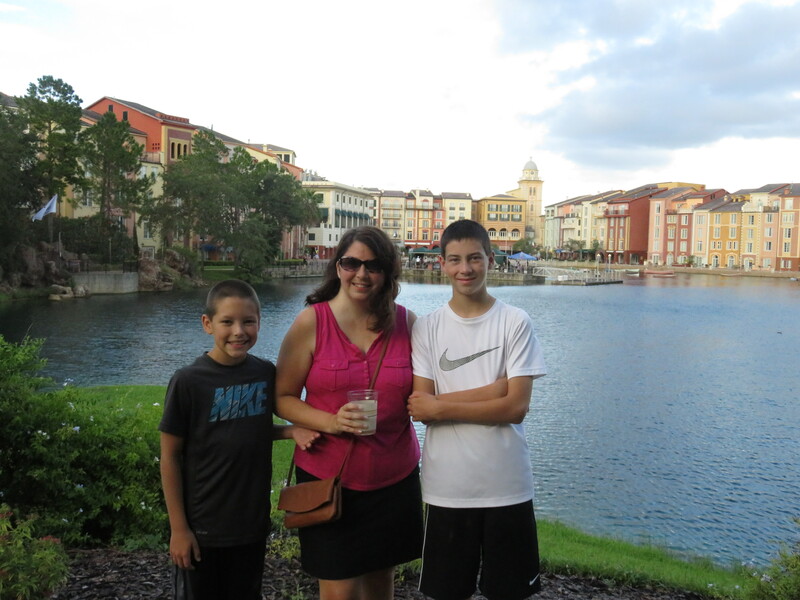 Contact us to book your Universal Orlando Vacation! 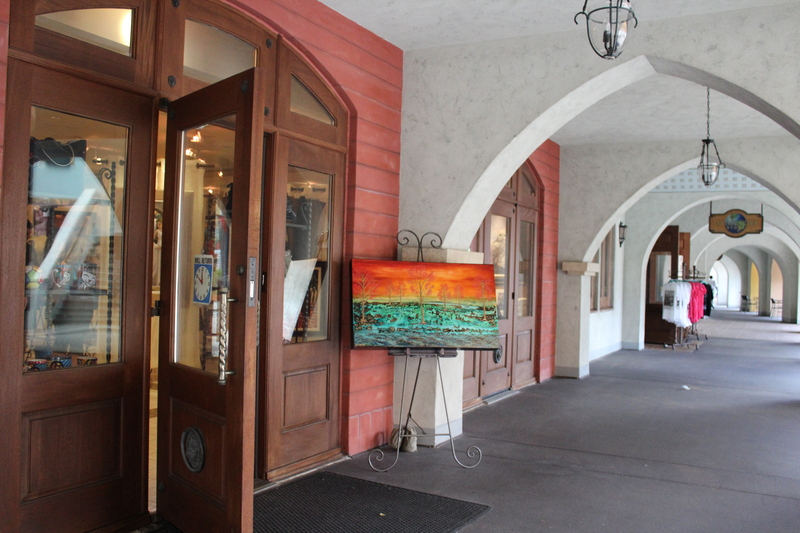 ← Sandals offers more than a trip — it’s a VACATION!